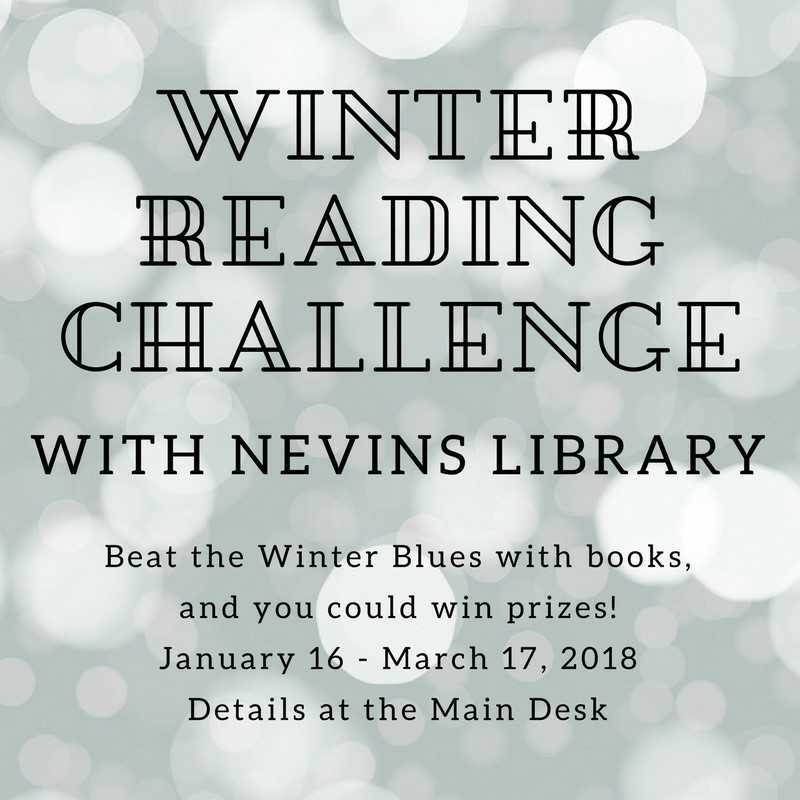 Introducing our Winter Reading Challenge! We hope this is just the thing to help keep those winter blues away. The Reading Challenge will begin on January 16 and run through March 17th. The basic idea is that we will provide 16 prompts and once you have completed a prompt, you will have earned one entry into the prize drawing at the end of the challenge. A couple examples of the prompts include: Read a classic, Read a book that takes place anywhere BUT the United States, Read a book with a green cover, and one free entry for bringing a food donation to the Friday Food Backpack Program. Participants need only be an independent reader with an active library card in the Merrimack Valley Library Consortium to be eligible for prizes. There will be multiple winners, thanks to the generosity of the Friends of the Library. Please see us at the Main Desk for more information and to sign up for the Winter Reading Challenge! Categories: Books, Programs | Tags: Reading Challenge | Permalink. I’ve always been a voracious reader, but it wasn’t until this year, that I put myself to the test and signed up for several reading challenges. For the past decade or so, I’ve been keeping track of the books I read with the title, author, and basic plot description in various book journals. Thank goodness I did that because I am now, prematurely I think, at the stage where I have to go back through the journals to see if I already read a book that looks somewhat familiar. How many of you have read 3/4ths of the way through a book before realizing that you already read it? Sheesh! This year I decided to put the pedal to the metal and get competitive with myself and see exactly how many books I can read in a year. In an effort to educate myself, a couple of years ago I started to read classic books that I missed out on in high school. How could I have gotten through 10 years of higher education and not read George Orwell? Aren’t all librarians required to read Ray Bradbury’s “Fahrenheit 451”? When my colleague introduced me to the Classics Club and their reading challenge, it was a match made in heaven — reading classics for my own erudition and getting external credit and praise for it! Thus, my first challenge is a doozy — reading 50 classics within a five year period. This year, my first, I have read 5 classics, so I have to step up the pace in the remaining 4 years of this challenge. I do feel smarter, though! Next up, the GoodReads challenge. As I write this post, I have read 97 out of 100 and I am on track to finish by the end of the month. I have also combined efforts with our Nevins team on GoodReads, so you can check out what your librarians are reading. Since it sounded fun and I thought it would bring my reading in new directions, I printed out the PopSugar 2016 reading challenge and chose to follow it privately. Even though it had interesting parameters to meet like reading a book with a blue cover, a book based on a fairy tale, a romance set in the future, I still read what I wanted to read and let fate decide what “fit in” with this challenge. The final result: 25 out of 40 book categories read. I didn’t really challenge myself with this. Maybe it was because I already had to read books I wasn’t comfortable with for the book groups I belong to? Finally, since I was curious and place setting appeals to me, I recorded what states and countries my reading led me to. In the United States, my reading took me on a cross-country trip through 26 of the 50 states. Louisiana garnered the most titles, 5, most probably because I visited New Orleans in March and it is such a colorful, dynamic place to read about. Internationally, good old literary England won out with 9 titles, although there was a good showing from the African countries (6 titles). Over all, 16 countries, not including America, were represented in the final tally. Going outside my comfort zone, I read 6 titles that largely took place in outer space, and even one book that took place far beneath the sea — 20, 000 leagues under, in fact. All in all, this has been a good experiment and one I am willing to embrace again for next year. Where will your reading take you in 2017? Categories: Bookish Confessions, Literary Resources | Tags: Classics Club, GoodReads, PopSugar, Reading Challenge | Permalink. Have you ever done a Reading Challenge? Wait, sometimes I don’t exactly have my book nerdishness quite in check. So let me start again… Have you heard of Reading Challenges? A Reading Challenge is a way to structure your reading goals, or maybe push your boundaries a little with the books you choose to read. With the coming of the new year, there are a plethora of Reading Challenges to choose from, and there are different formats as well. So you can find a Reading Challenge that fits your reading style. I personally love to sign up for Reading Challenges! I challenge you to read ALL THE BOOKS! Challenge as well. Click HERE for their 2016 Challenge. This challenge provides a list of categories for you to check off with your reading. For example, this year’s categories include “A Book with a Blue Cover” and “A Book that takes place on an Island”. You are on the honor system here, and need to keep track of your progress yourself! This is a fun challenge though as it will likely get you out of your comfort zone a little! The Classics Club is a multi-year challenge of sorts that you may be interested in, if you enjoy or want to read more classic literature. (In full disclosure, I am one of the moderators of the Classics Club.) To become a member of the Classics Club, you create a list of 50 Classics you’d like to read in the next 5 years. That’s it! Many of the members have blogs or other spaces online where they write and share the books they are reading, and these are linked through the Classics Club website as well. The Club is also dedicating 2016 to Women’s Classic Literature, so many members will be reading and writing about classics written by women. A quick internet search of “Reading Challenges” will bring you plenty of other challenges to peruse as well! There are some dedicated to specific genres, some to format like e-books, and more! So I guess my Bookish Confession here is that I’ve been doing these kind of challenges for years (sometimes successfully, sometimes not) and I find it a little addicting. I find it rewarding to hunt for books to read that both fit a challenge and that I’m interested in reading. (I told you that I’m a book nerd!) I have a lot of fun with these, and I hope you might too. Let me know in the comments! 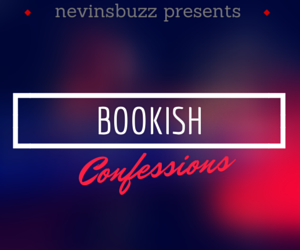 Categories: Bookish Confessions | Tags: Reading Challenge | Permalink.